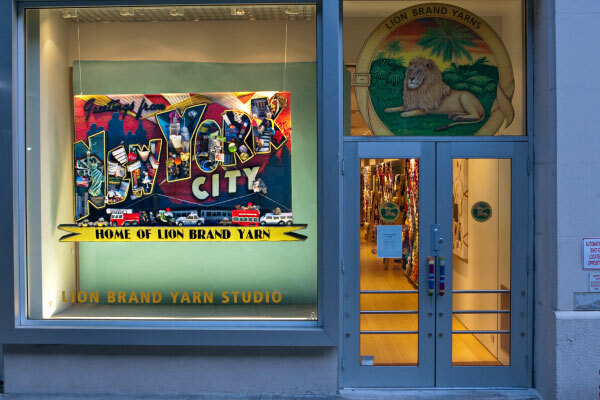 In this Episode: This week’s audio postcard features the streets of NYC, sounds of Grand Central Station, and interviews with some of the people who make the yarn happen at Lion Brand Yarn Studio. Music by Miodrag Marjanov, and Nell Balaban. Always love your podcasts, been listening for years. This was interesting, but really felt like a long commercial for lion brand. I thought any second you were going to announce them as your new sponsor. I downloaded this episode from iTunes and I’m pretty sure that the download is the previous podcast. Either that or I am experiencing deja vu…. Thanks for ALL your podcasts – you are still my favourite podcaster!! What a nice visit to Lion Brand Studio and NYC. The interviews reminded me of what it was like for my mother’s family to have a family-owned printing business on the edge of the Village. It’s now moved out of the City to Westchester County and my cousins are playing a primary role, with my uncle in and out these days. But yup, same accent as the Blumenthals! My apologies! There was an issue with the podcast feed. It’s been corrected now and the podcast is showing up in iTunes. You’ll need to delete the episode, unsubscribe and then resubscribe to clear the error. Just settling down to listen to you as I try to get my Ravellenic Games “Goodale cardi” finished in time. . .
Yeesh, Brenda, thought I was going nuts… was listening to I Heart NYC in my car, which has pretty unintuitive player controls, and kept wondering why I was hearing episode 119 again. Was it a test? Seriously, got it now, thanks for the instructions. You are a master at clear instructions, but you know that, don’t you? Brenda, Have you tried the Outlander series by Diana Gabaldon, Anna Pidgeon series by Nevada Barr, the Cat Who series by Lilian Jackson Braun. I have been an Audible listener for years! Just correcting my email. Love the podcast. Thank you for the lovely audio postcard from Lion. I admit, I was a pretty horrible yarn snob ignored Lion until I heard of your adventures there. I tried them out – and they’ve got some great yarns, and I’m delighted to find them. I have now lost count of the number of ways that you have helped me with my knitting and crochet over the years, thank you so much. Loved the postcard from NYC. I was so happy that it was almost 20 minutes long. I expected them to be five minutes. Well done. Made me miss my old home town. I used to walk by that store regularly because I lived farther down 15th Street. Never went in back then, but they had very nice windows. EvelynU, that was great homework on the Lion Brand logo.